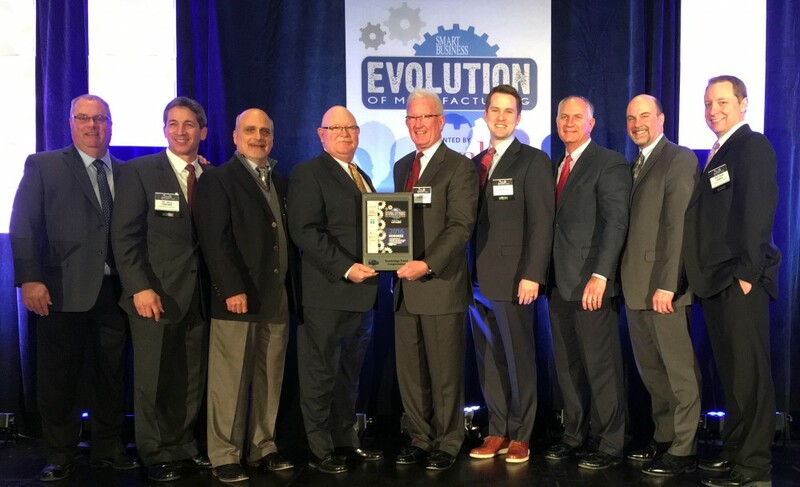 MEDINA, Ohio, February 19, 2016 - Sandridge Food Corporation was honored and thrilled this week to receive the 2016 Smart Business Evolution of Manufacturing Award. Sandridge proved to excel in their ability to innovate, create and drive processes resulting in a positive impact on both their top and bottom line. Sandridge has been recognized for their ability to adapt to retailer and consumer demands calling for fresher food products by investing in two High Pressure Processing (HPP) lines, the first in 2010 and the second in 2013. The investment was based purely on consumer insights nationally and globally. Because HPP significantly mitigates bacterial growth, it reduces spoilage, minimizes shrinkage and essentially reduces the potential for recalls due to bacteria throughout the shelf life. HPP alleviates shelf life stability as a barrier for crafting recipes and lets Sandridge Foods to remain competitive. Most importantly, it allows chefs the opportunity to realize their passion and achieve Sandridge Food’s mission: “To create great tasting food,” through elimination of preservatives traditionally necessary to survive the fresh distribution channels. The company also feels it has a responsibility to be environmentally focused and has implemented eco-conscious processes at its facilities. In 2015, more than 2,300 tons of plastics, tin cans, cardboard and vegetable waste were recycled.